In the run-up to this year’s Scotiabank Giller Prize gala on October 30, we’ll be posting Q&As with the longlisted authors to gain insight into their work and find out what books they admire. We kick off our series with a bonus: an interview with this year’s Readers’ Choice winner, Peggy Blair. [more…]. Mark Bourrie: Whodunnit and How? Penguin Canada has acquired a Cuban-Canadian police procedural, The Beggar’s Opera, by Peggy Blair, one of Canada’s leading aboriginal lawyers and a former Crown prosecutor, the publisher has announced. Blair, an Ottawa resident, was shortlisted for the 2010 Debut Dagger at the Harrogate Crime Festival in England. A former member of the Canadian Human Rights Tribunal, she was a senior adjudicator in the Indian Residential Schools Dispute Resolution Process, before being appointed deputy chief adjudicator in 2007. She returned to private practice in 2008. Penguin Canada has acquired The Beggar’s Opera, a Cuban/Canadian police procedural by Peggy Blair, one of Canada’s leading Aboriginal lawyers and a former Crown prosecutor. Blair was discovered by UK agent Peter Robinson (who represents Ian Rankin and Denise Mina) after being shortlisted for the 2010 Debut Dagger at the Harrogate Crime Festival, and the novel was acquired from Canadian agent Anne McDermid in a two-book deal for World English rights. Rights to the series have been sold to Rowolt in Germany, Cappelen in Norway, and Unieboek in Holland. 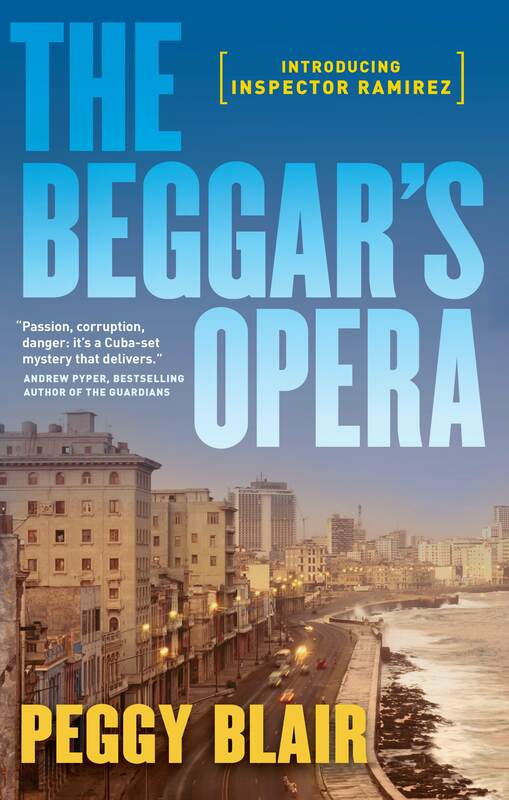 The Beggar’s Opera is a brilliantly plotted and deeply imagined crime novel that evokes the crumbling beauty of Old Havana, as well as its bureaucracy and political corruption.The character at the heart of the novel is the hardworking Inspector of the Major Crimes Unit of the Cuban National Revolutionary Police Force, a man who is suffering from the same dementia that killed his grandmother, a form of dementia that makes him see ghosts – the ghosts of the victims of unsolved murders. When the abused body of a young Cuban boy is discovered at a popular tourist spot, the evidence points the Inspector to a Canadian police officer on vacation. A former member of the Canadian Human Rights Tribunal, Peggy Blair was a Senior Adjudicator in the Indian Residential Schools Dispute Resolution Process between 2003 and 2006. In 2007, she was appointed by the court as a Deputy Chief Adjudicator, responsible for supervising adjudicators in Eastern Canada and for developing policies to implement a hearing process for 12,000 victims claiming sexual and physical abuse at Indian residential schools. She returned to private practice in November 2008. While maintaining her law practice, Blair worked for the Royal Commission on Aboriginal Peoples as a policy advisor on land claims and dispute resolution issues. She was also the Chief Federal Negotiator in self-government negotiations involving 27 First Nation communities in northern Ontario (1997–1998). Along with her LLB, Blair has a Masters and a Doctorate in Law and is named in Canada’s Who’s Who. Penguin is one of Canada’s pre-eminent publishers of literary, thought-provoking fiction and non-fiction, and the publisher of Stieg Larsson’s Millennium Trilogy, which has sold over 1.6 million copies in Canada.